The Vegan Magpie: Love Seitan May offer! Hello! 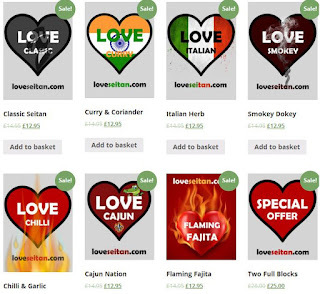 Super yummy Love Seitan are running an offer on all of their seitan throughout May! You can get full blocks (800g) of each flavour for £12.95 instead of £14.95, for choose the two full block offer (where you choose two flavours) for £25. Postage is free over £20, or £2 under £20. They have also released a new flavour of fiery fajita! (Also on the offer) Yumyum!